Save SAR 61 (43.88%) – Earn 7 Shukrans What is Shukran? Shukran is the Landmark Group’s award-winning loyalty programme in the Middle East, which allows you to earn Shukrans when you shop any of our brands. 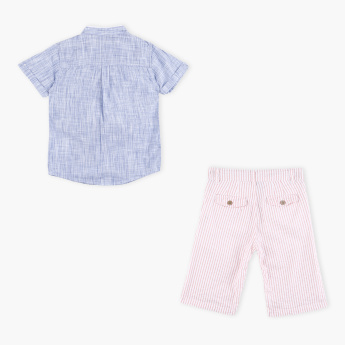 Pick this trendy outfit for your little one which is a perfect pick for a casual outing. The mandarin collar of the shirt and stripes all over the shorts add a flair of style to its overall look. The quality fabric of the shirt and shorts will keep your champ comfortable all day long.